Follow SM Accessories on Twitter and Instagram @smaccessories and like their Facebook page here. These days, it’s so hard to find the perfect outfit that will set you apart from the rest. And with upcoming holiday gatherings and parties, of course you’d want to shine and stand out. Freeway comes to the rescue with its specially made prints and treatments turned into unique designs, perfect for women who are trendsetters and fashion seekers. This time, Freeway comes out with its latest collections Embro and Mod Prints! Released last August, Embro Prints is all about feminine styles with intricate embroidered detail. Those with a taste for a simple yet lovely look are sure to enjoy this collection. But if you opt for something bright and loud, Mod Prints will definitely do the trick. With its optically alluring patterns and 60’s inspired vibe, it’s all about having fun while looking fab. Mod Prints was released in stores on September. With designs you can’t see anywhere else, Freeway is sure to help you make a fashion statement wherever you go. For more information on Freeway's collections, visit their website here. You may also like their Facebook page or follow them on Twitter and Instagram @FreewayOnline. Now on its 5th year, Ensembles is back with another budding fashion designer for its Young Designer Series 2013. Ensembles is all about the strong and independent woman with a style that’s fashion forward yet elegant. That’s why this year’s collaboration with Vania Romoff is a perfect match. With her designs being predominantly classic and feminine, Vania’s design aesthetic is definitely fit for an Ensembles woman. Her collection is a variety of tops, dresses and jumpsuits featuring easy to wear pieces and key classics that are both functional and chic at the same time. As for the silhouettes, it is a showcase of simplistic lines and basic shapes flattering to a woman’s curves which is one of the highlights of Vania’s design persona. The collection is also a multitude of different trends and styles such as color blocking, prints and soft drapes presented in mostly subtle colors and neutrals, all capturing a woman’s grace, maturity and charm. A fresh take on vintage was the highlight of the campaign shoot for Vania’s collection, complete with a classic yet fun styling featuring shoes from Janilyn. Described by Vania herself as a fresh yet timeless collection, her pieces will surely capture the attention of women of all sorts. Whether it is worn in the office, a smart casual affair or on a simple lovely day out, Vania’s pieces will definitely bring out any woman’s confidence and highlight their beauty. The Young Designer Series 2013 Collection featuring Vania Romoff is set to release in Ensembles stores nationwide this September! For more information, please log on to ensembles.com.ph or visit their Facebook page. You may also follow them on Twitter and Instagram @EnsemblesOnline. Giordano's "Denim Now. Denim Forever"
Since it was invented in 1853, the sturdy fabric has been molded into different fits and styles - bellbottom, boot cut, bleached, washed, colored. And in celebration of this classic material, Giordano Philippines launches "Denim Now. Denim Forever". In this collection, Giordano highlights the classic beauty of raw denim. "The dye is expected to fade gradually with continuous washing. This is one of raw denim's unique characteristics and it must not be considered as an imperfection," Ella Santos (Giordano Philippines Denim Category Buyer) said. Giordano raw denim jeans come in two kinds of fits and styles: tight tapered and slim tapered for men, slim tapered and skinny straight for women. Colored denim jeans, on the other hand, expresses fun, comfort and style. Similar to Giordano's legging jeans, the spandex content in these pieces allows wearers to move freely and comfortably. The jeans are available in 8 different colors - classic black, washed red, oxblood, mustard, blue turquoise, navy blue, dusty white and dark denim - in skinny tapered for women and tight tapered for men. Pieces from the Giordano's "Denim Now. Denim Forever" are available in all Giordano stores nationwide at an affordable price of P999.00, starting August 23 until mid-September. This promo is available at all Crumpler stores: Shangri-La Plaza Mall, TriNoma, Robinsons Magnolia and Bonifacio High Street. 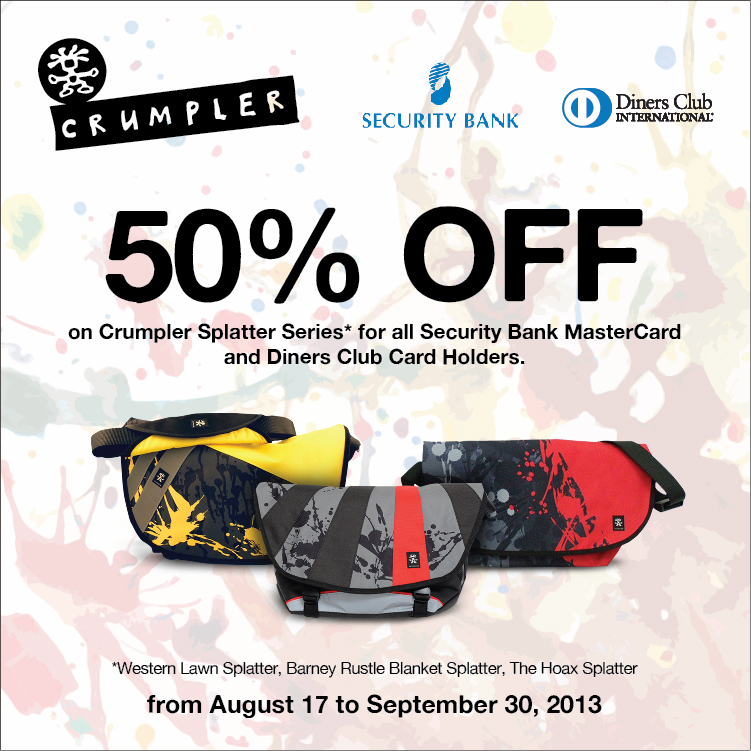 For more information and updates, check out Crumpler Philippines' Facebook page and Twitter account.